Pilates is one of the most popular exercise trends today. Each Pilates workout helps lengthen and strengthen the muscles while working specifically on the core, thighs, and glutes. The results from consistent Pilates training includes leaner muscles and improved flexibility among other benefits. This form of exercise was developed by Joseph Pilates to aid with physical rehabilitation. 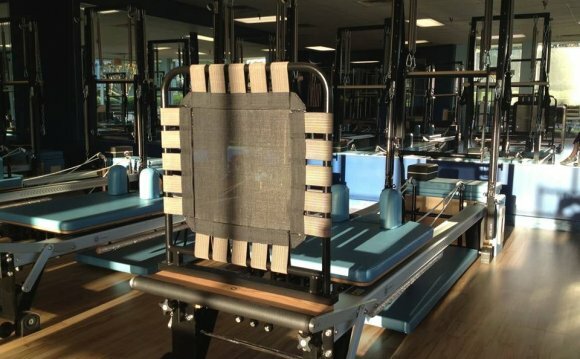 The mat work we offer at Fitness Evolution is designed to bring body awareness and improve your overall posture, balance, strength, and wellness. In many ways it is similar to yoga with regards to the results members can achieve. However, yoga is designed to more deeply connect the body, mind, and spirit; often incorporating meditation into the practice. Gym members can choose from a mix of yoga and Pilates classes at our Silver Spring location. Pilates helps create long, lean bodies while working the muscles and toning the body. Controlled positions and standard exercises make up the typical Pilates routine, which includes plank work and the Pilates 100. The theory behind Pilates strength exercises is to keep the body in optimal alignment. The focus on tightening the core is important throughout each workout to help support the back and practice good form. Instructors will also guide the class through mindful breathing to make the most of each movement. Pilates is built upon six principles: precision, concentration, centering, control, flow and breathing. These are the backbone to every Pilates workout and provide long-lasting benefits for anyone who incorporates them into their workout. Pilates work is typically done barefoot with only a mat necessary for the workout. The flow of the class will depend on the instructor, but will always include the basic Pilates movements. Modifications are offered to increase or decrease intensity based on how rigorous of a workout you want. With this type of exercise, it’s encouraged to listen to your body and how it feels during different positions and stretches to avoid over extension or muscle strains. Pilates is a versatile exercise and can be alternated with cardio and weight training for a comprehensive workout regimen. There are also plenty of benefits to taking Pilates on its own, especially when you create benchmarks for improvement based on your own personal health and fitness goals.